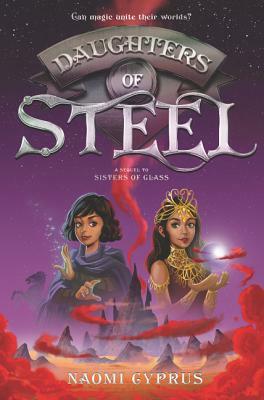 Two girls from two different worlds must unite to save each other in this sequel to the middle grade fantasy Sisters of Glass, which Kirkus declared “will inspire many to find the light within” in a starred review. Fans of the Descendants novels, the School for Good and Evil series, and Aru Shah and the End of Time will be swept away by this enchanting duology that’s Frozen meets Aladdin. Halan was once a powerless princess. Now she’s taken her rightful place as queen of the Magi Kingdom—but she wonders if she’ll ever be the ruler her people deserve. And Nalah used to be a powerful pauper. Now she’s the Queen’s Sword—but the more Nalah’s powers grow, the more unruly they become. One vision changes everything. Nalah embarks on a quest across the desert to harness her powers, while Halan must travel through the Transcendent Mirror to help the Thaumas of New Hadar. As a dark threat draws closer, can Nalah and Halan reunite to save both worlds—and the future of magic? Naomi Cyprus is the author of Sisters of Glass and Daughters of Steel. She lives on the beach with her two cats, Pim and Haze. She came up with the idea for Halan’s and Nalah’s worlds while walking on the sand one day, when she imagined that each grain had the potential for magic. Ms. Cyprus loves strong tea and occasionally dyeing her hair blue.